Is it really February already!!? WOW! 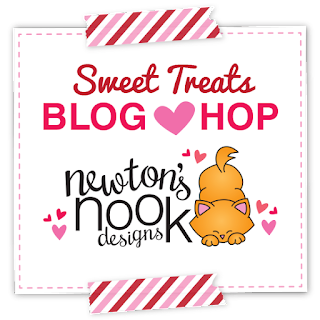 Today the Newton's Nook Designs Team is hopping along today to share some great Sweet Treats - just in time for Valentine's Day! Make sure you scroll down to the bottom of this post to see the whole list and hop along and comment for a chance to win! 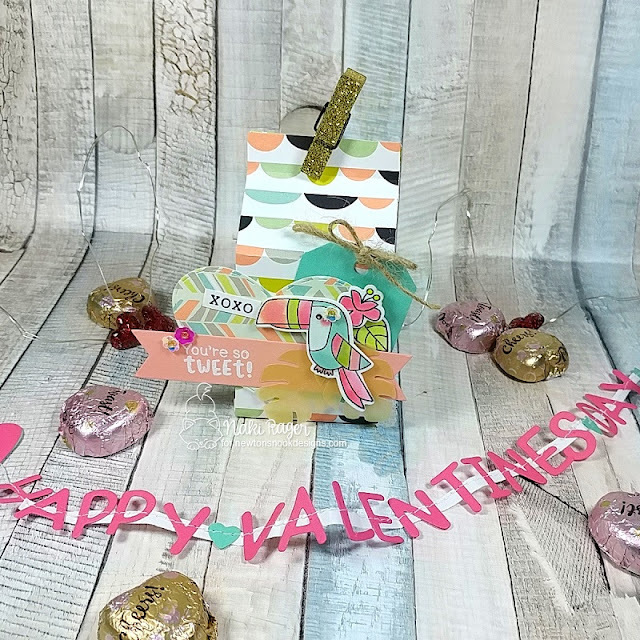 For my little treat, I created this little milk carton with fun patterned paper and dressed it up with layers of die cuts using the NND products today ;-) I wanted to show you that you don't need a Valentine's Day stamp set to create a little Valentine treat. This adorable toucan is from the Toucan Party Set, I watercolored one of the toucan images with fun, tropical colors. I also stamped and watercolored the sweet little tropical flower and one leaf and tucked them behind my sweet toucan after die cutting them using the Toucan Party Die Set. 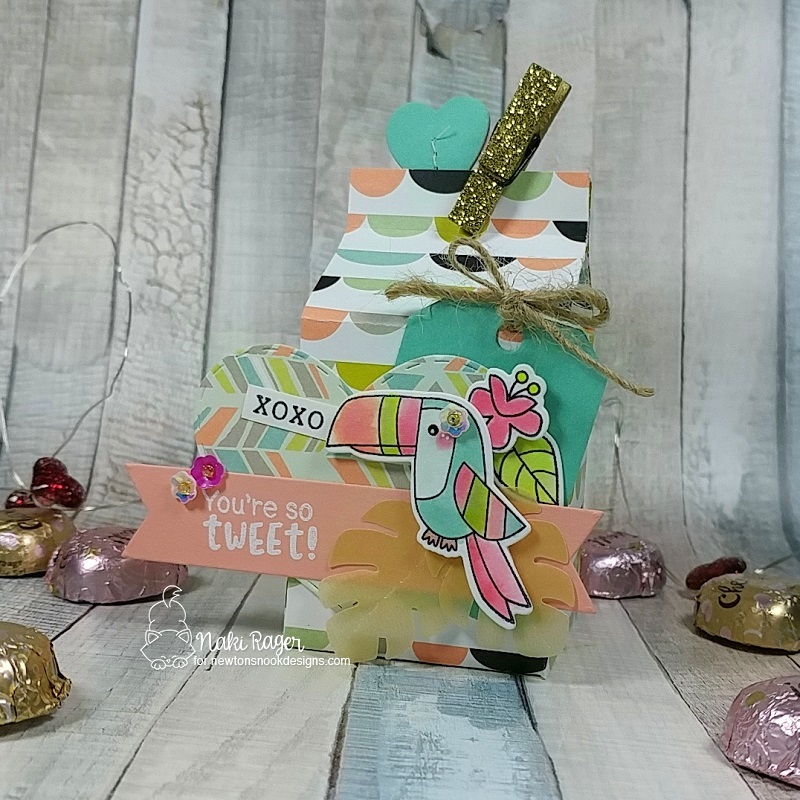 My sweet toucan is sitting on 2 big leaves that were die cut from gold vellum using the Hibiscus Die Set. 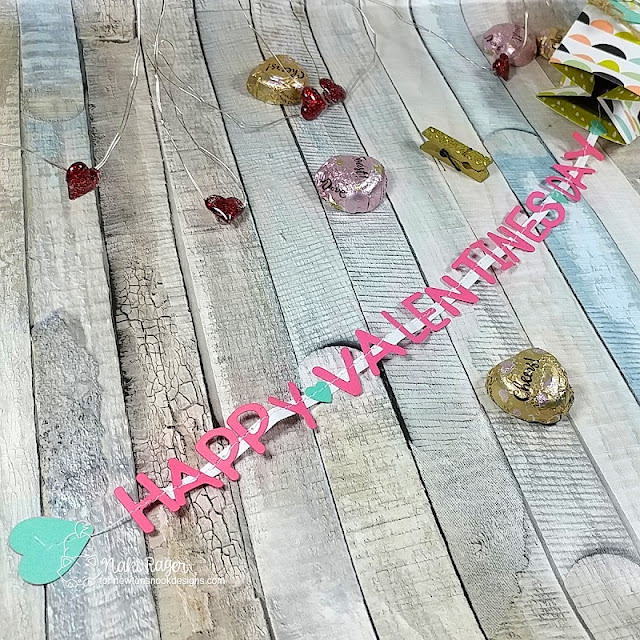 To create all the fun layers, I die cut the banner using the Frames & Flags Die Set and heat embossed the cute sentiment from the Toucan Party Stamp Set, die cut the stitched heart using the Darling Hearts Die Set, and the little tag was die cut using the Tags Times Two Die Set. The little XOXO stamp is from the new My Type Set, I simply stamped it with black ink on white cardstock and trimmed it down. I used 2 different, pretty busy patterns but because I coordinated the colors in every piece, the patterns are not fighting against each other. Now you didn't think I just decorated this little milk carton and was done, did you!? This super fun, pull-out-sentiment was die cut using the Essential Alphabet Die Set, and the hearts were die cut using the Darling Hearts Die Set. I originally sewed them without any backing but it wasn't easy, and it turned out not so pretty 😣 so I trimmed off about 1/4" of printer paper and sewed the letters onto it, and it worked much better! For the finishing touch, I added a few flower sequins with seed beads inside of them, cute, right!? Naki this is adorable!! I love tge little message on a banner! how cute! 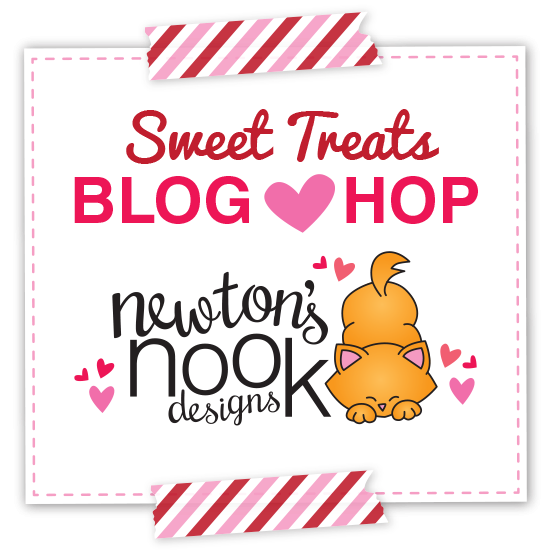 Sweets and treats! Wow! That pull out sentiment is the cutest! What a fun idea! And I love the treat tote with the fun bright colors and the cute toucan! So cute! :) Love that little toucan. Love the tropical colors... especially now with snow all around me. I love your milk carton and banner! Beautiful tucan! I love your pastel colors and the banner in the bag was a nice surprise. toucan is colored so very pretty; love the colors. What a wonderful idea and design! Love the stitched letters! Really clever and cute! So cute. Love the tropical colors and the surprise inside. This colour scheme is everything! I love your color scheme! And what a great idea with the little banner inside! I love your sweet box of love! The banner is a great fun idea! 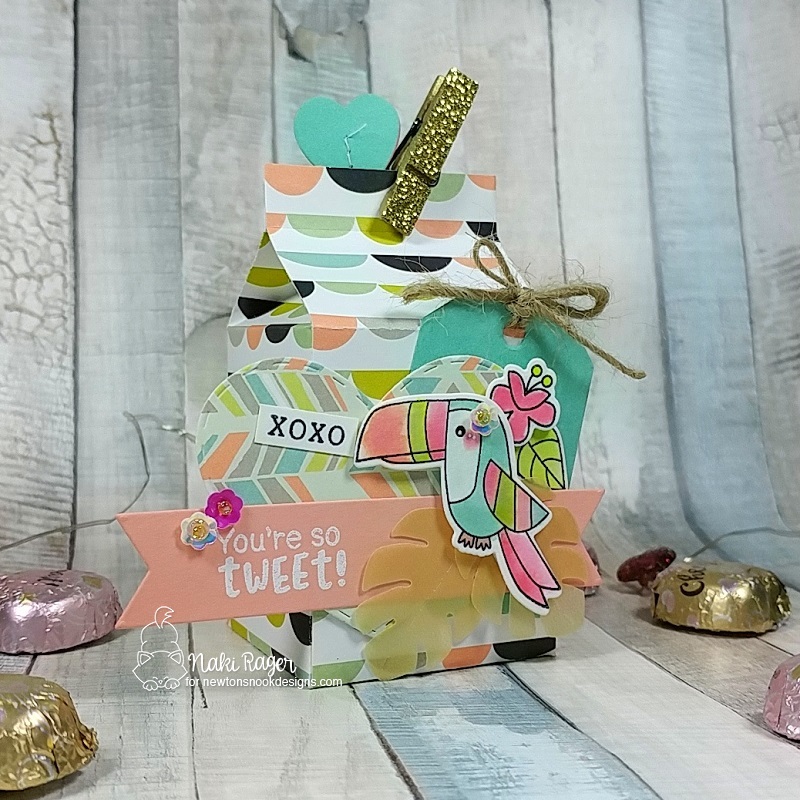 Love your fun message in the decorated milk carton! Awesome details! Cute project! Love the banner. FUN & FABULOUS SWEET treat! LOVE your non-traditional toucan Valentine, LOVE your stitched sentiment banner inside ... the chocolates sound tasty too! Love this great gift idea and it is a great way to use up your pattern paper you might have extra of , or is hanging around. Adorable gift and banner, love the bright pops of color! Hands down....the hop winner right here! What a cute way to use these tropical stamps for a Valentines themed gift! Such an original idea! Love the Valentines Day Banner! Love your choice of colors. That sentiment banner is the star. 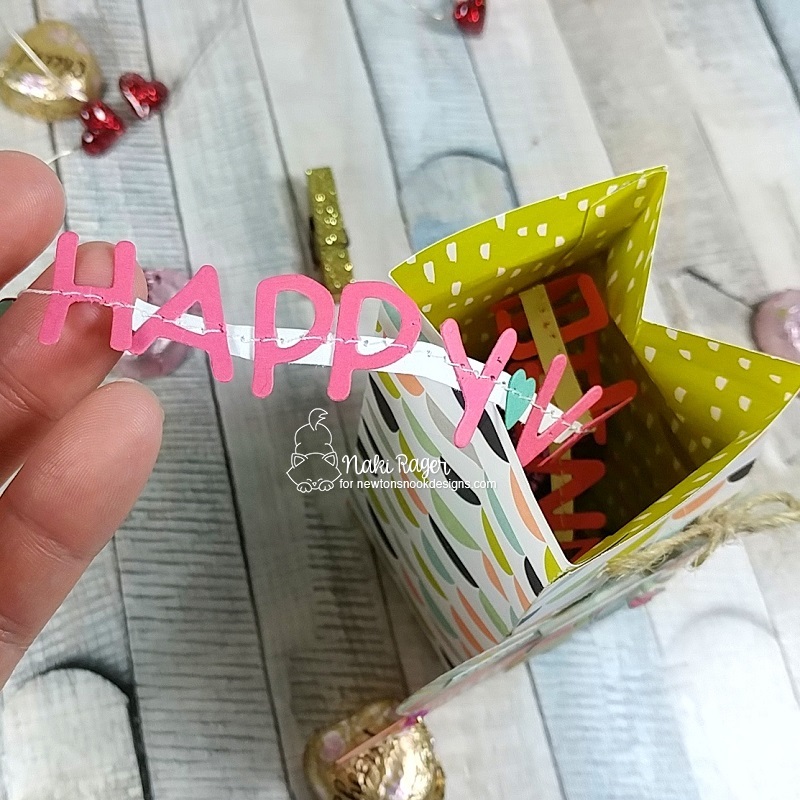 Absolutely adorable gift treat box, well done. This is so cute! I love your non-traditional colors and all of the layers! These toucans are one of my favourites! And the sequin flowers you used make this little gift even more special. The banner idea i love so much too! 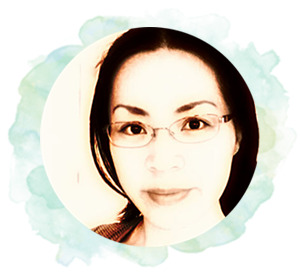 Delightful project! Love those colors with this toucan set! I LOVE the idea of using non holiday stamps to make a holiday item.. way to go! This was just as tweet as could be... then you made it over-the-top with that pull-out banner! Amazing! 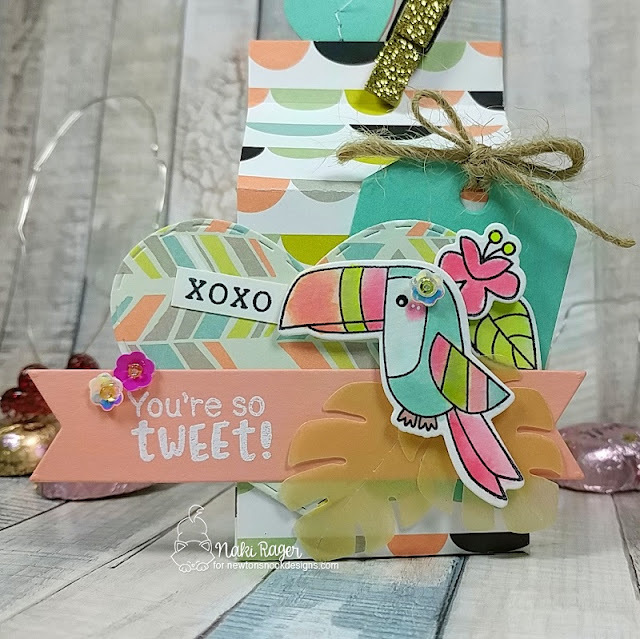 LOVE the pastel toucan!! !